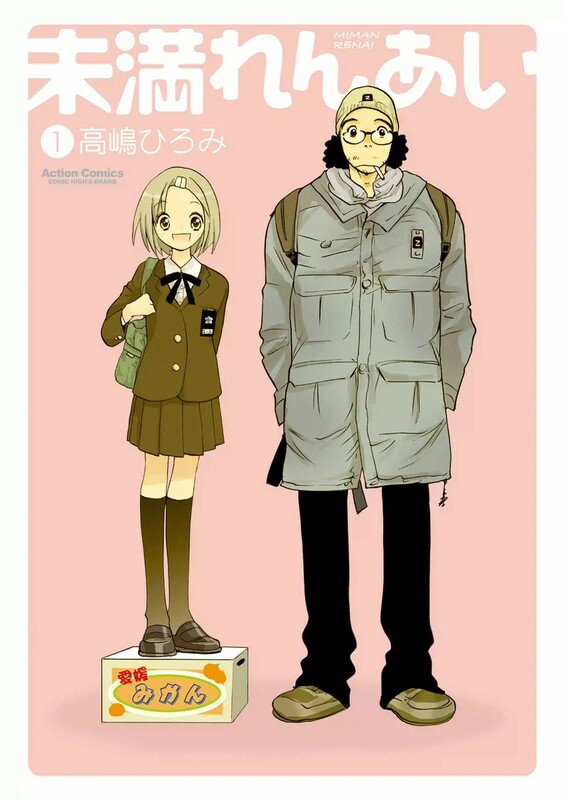 Miman Renai (未満れんあい, Insufficient Affections) is a romance manga series by Takashima Hiromi (高嶋ひろみ) concerning the relationship between a roughly thirty year old man and a fourteen year old middle school student. 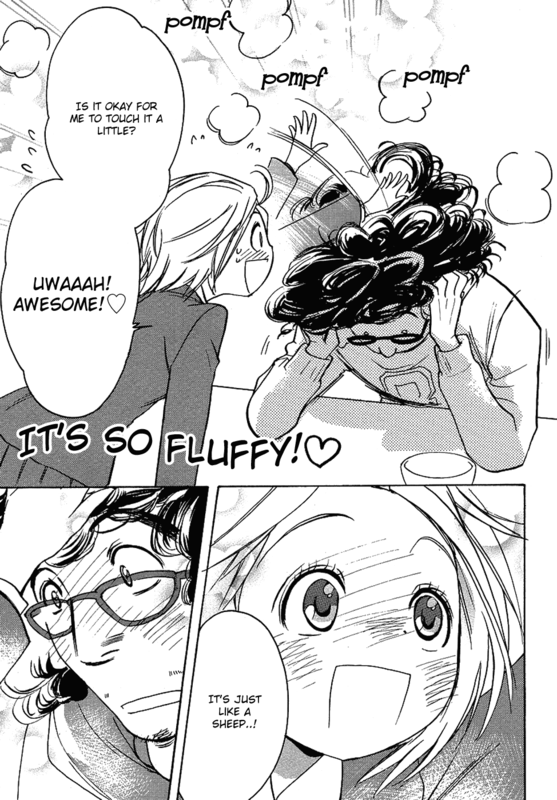 Believe me when I say it’s probably among the most innocent and cute romances you’ll ever see. Takashima-sensei accomplished what she set out to do: to depict an absolutely pure love between two people not based at all on sexual attraction. 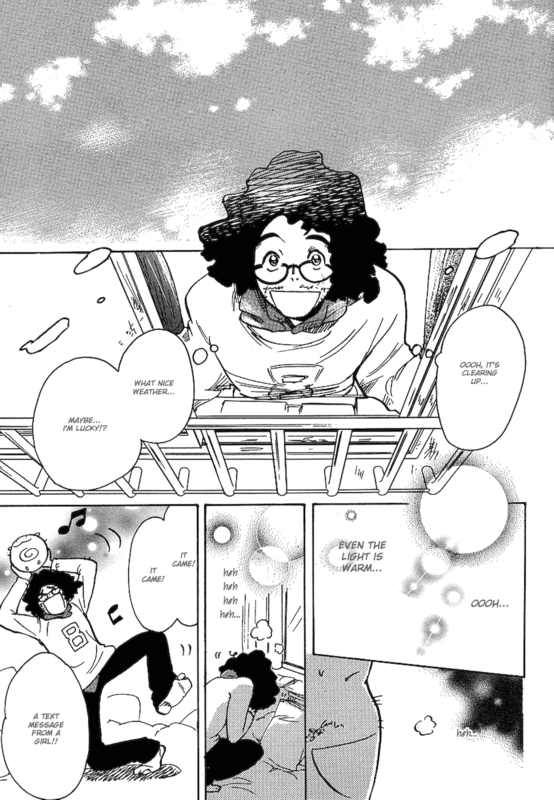 Miman Renai is not a favorite of mine among romance series, but I still like reading it from time to time because it’s quite adorable and thoroughly amusing. In order to make it clear that all intentions in this relationship are innocent, Takashima-sensei pulls out a number of things, mostly concerning the protagonist, Kazumi Kurose. Kurose is kind of a low life, not because he’s some gross scumbag, but because he lacks all motivation and simply moves through his life these days without any care or concern. Rather than lackadaisical, he comes across like a walking corpse. He’s never fallen in love, he can barely recall even having ambitions, his apartment is a disaster area, and he’s an eroge (pornographic game) otaku (fanboy) with a legendary record for clearing galge (“girl games”, basically dating sims). 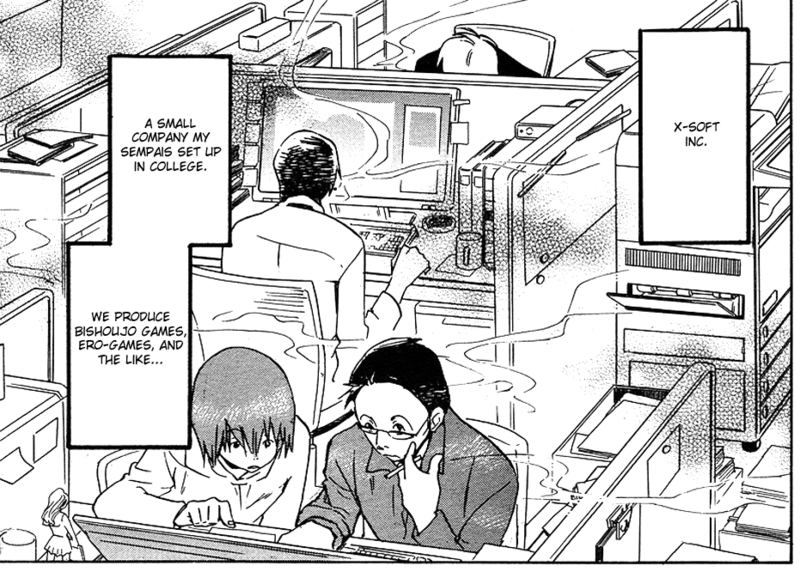 What’s worse, he works for an eroge developer as a programmer. He just smokes, sits at his desk clacking away on his keyboard, heads out for a (usually unhealthy) lunch, and eventually wanders back home. He doesn’t care about his appearance since he works at a company with a lot of slovenly peers, and just about the only positive about him seems to be that he’s an excellent and highly skilled worker, such that his coworkers respect him a great deal. Generally speaking, though, he seems like a hollow individual. 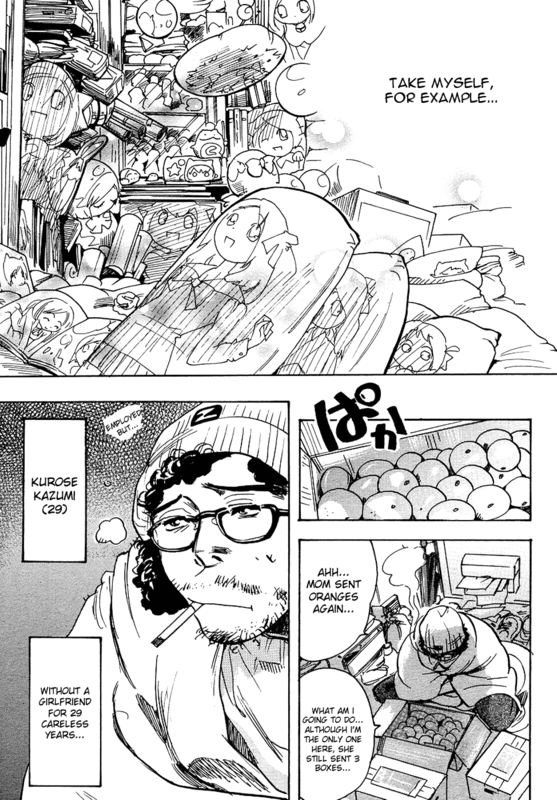 The manga begins with him receiving a load of oranges from his mother — apparently a regular occurrence — and wondering what to do with them. He brings them into work to share and goes about his day as usual. We learn how zombie-like he can be, see how good he is at his job, and find out that his preference in women is for mature girls; younger, flat-chested sorts do nothing for him. Eventually it’s time for lunch. He picks up the box of oranges he brought in and heads to a cafe recommended to him by a coworker who said the waitresses were hot. He agrees with that assessment when he arrives, and while he’s admiring them a kid rolls up on him and takes a seat at his table. Before he can respond to this curious behavior, she rejects him. This girl is Osawa Tomoe, the main heroine of the series. 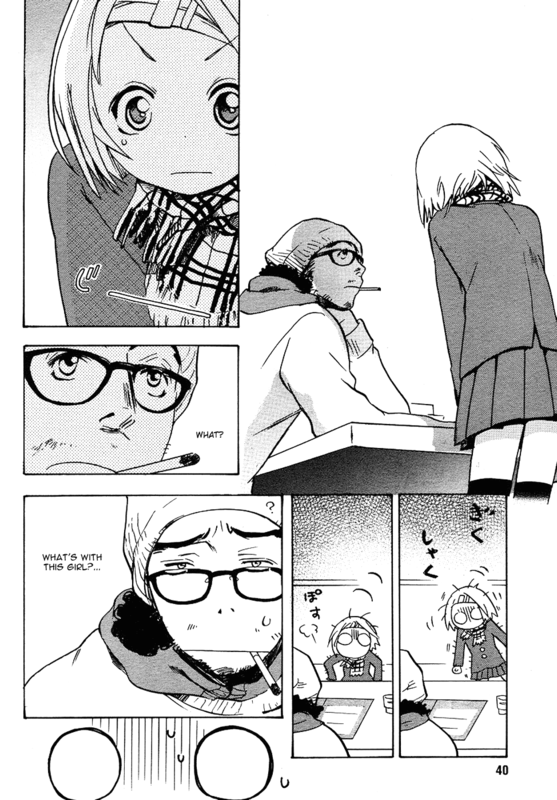 It turns out she was sent to this restaurant looking for a boy in a cap and glasses by her friend. Concerned over her love life, her friend set her up to meet this boy to see if they might hit it off and start going out. Tomoe came to the restaurant just to properly turn the other kid down, believing herself to be too young to get into any relationships. She is, at this point in the series, just a first year middle school student (so, thirteen years old) and so she doesn’t feel she’s ready for any romance. Kurose is incredibly taken aback by all this and needs to take a moment to process it all, stopping her and explaining that she has the wrong guy. After he learns about what guy she was looking for, he loses it in laughter. Him? A middle school boy? It’s too much. His teasing causes Tomoe to laugh as well, and Kurose is taken aback once more. Just like that, Kurose falls in love. The rest of this relatively short series (it’s over in 30, 23-page chapters) plays out slowly and in the same sort of way over and over until the end. For most of the series, Kurose tries to get closer and learn more about Tomoe, and Tomoe grows interested in Kurose. Kurose finds Tomoe’s bumbling and bubbly personality to be very cute, and the maturity she steadfastly displays (like how she came to the restaurant to politely reject someone) is charming. He has no interest in her body, and in fact never even brings it up once in the series. He just wants to see her smile, feeling very blissful in her presence. Basically, he’s terribly innocent. 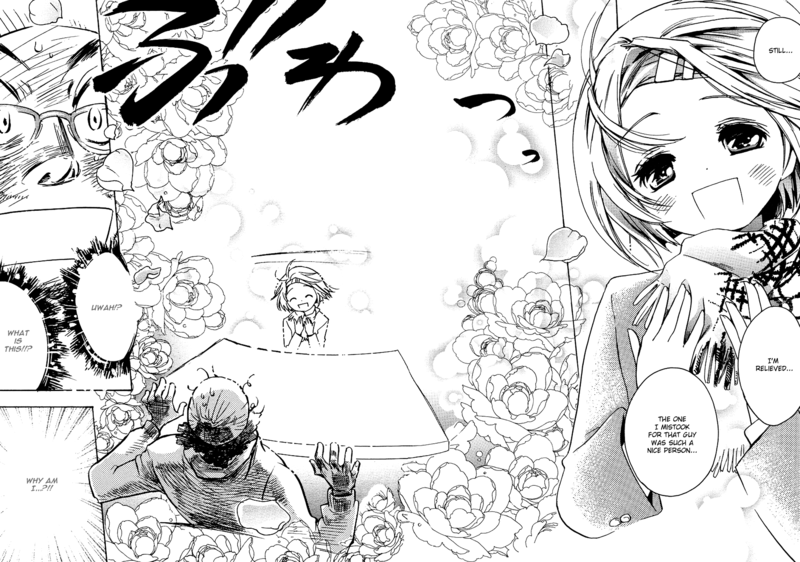 Tomoe is also innocent. 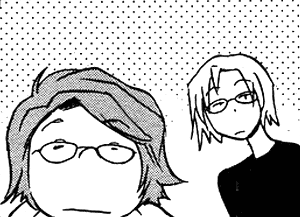 She sees Kurose as a funny, nice person and doesn’t see any problem with being a ~30-year-old man’s friend. During their initial meeting, she tries to leave the table early not because “ew, an old man!” but because she doesn’t really have enough money to buy much of anything from the restaurant (and she insists on paying her part). Over time at Kurose’s sometimes rather forward behest, they remain in correspondence and end up hanging out fairly often. To her, Kurose is a very cool, very good person who’s incredibly amusing for his silliness and awkwardness. This admiration makes Kurose feels a little guilty, however, because though he says he’s a game developer the games he makes are secretly perverted. This is eventually addressed in a pretty interesting way, though. Ah, yes, and Kurose has quite the ‘fro. Before that, love really improves Kurose’s overall being. 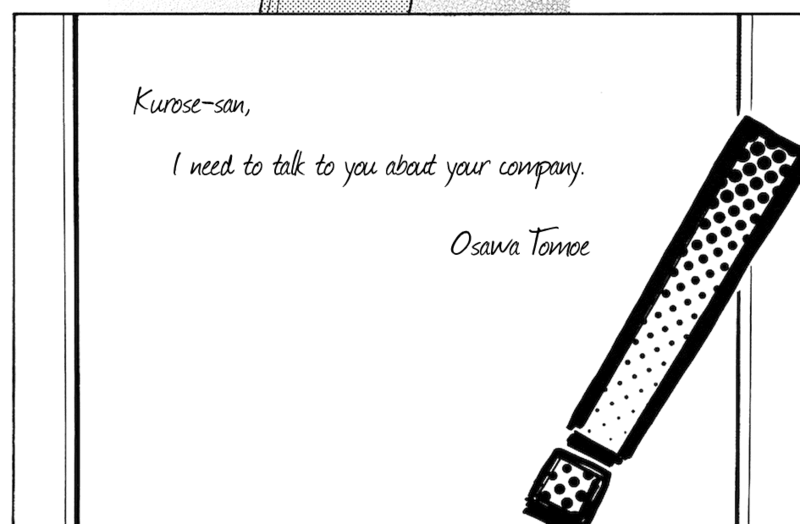 After getting Tomoe’s email address by giving her a bunch of oranges and his business card, Kurose’s life fills with light. He cleans himself up and has a very happy disposition. It’s like he’s suddenly truly alive for the first time since the series began. Unfortunately, Kurose is so innocent I might also call him a moron. 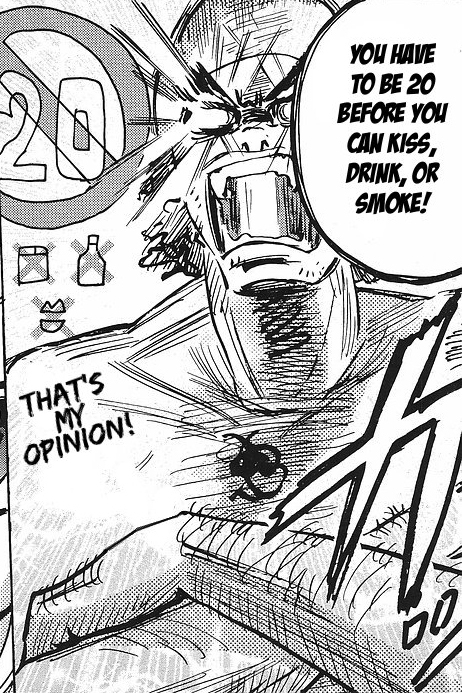 He does some incredibly stupid things throughout the series usually under the mindset of “I’m in love!” with consequences not entering his head even once. He gets pretty obsessive and blind in his love, too, so even his efficacy at work ends up suffering. He really shoots himself in the foot a lot, and at quite a few points would have totally been cut off from Tomoe if not for Tomoe’s vast amount of kindness. Don’t get me wrong, the situation feels more like “these two really are made for each other” rather than “this feels contrived”, but nonetheless watching Kurose’s antics can be very frustrating. He also ends up depressed and discourages himself a lot. With a few less absurd actions, Kurose would feel pretty realistic. He’s a guy who hasn’t changed much in his life, never amounted to much, and the most experience with girls he has is from wooing 2D ones. But, it’s a good thing these are the problems I have with this relationship. Frankly, although it is brought up, the idea of a 30 year old trying to date a 14 year old never feels wrong; this pair of dummies are too dumb. Their interactions are pretty much exclusively funny and cute, with “drama” being severely limited and often made light of. The manga is very relaxed and cute, almost qualifying as iyashikei, but just a bit too frustrating in some respects for me to call it such. 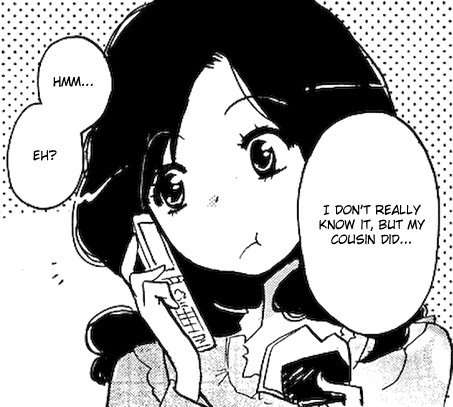 There are a handful of side characters in Miman Renai but they feel mostly insignificant. There’s Tomoe’s best friend, Kurose’s coworkers, and the president of Kurose’s company. 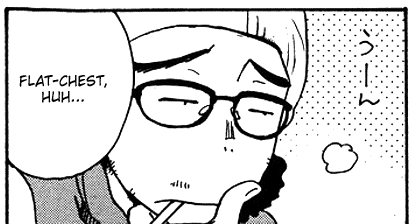 Most of them are just here for jokes, though some of them also provide some dramatic development. Of them, the president is certainly the most important side character, being a major figure from Kurose’s younger days. She was the one who offered him a position at the company, and it’s heavily implied that she has some sort of romantic interest in him (although when they met, she had a boyfriend). We learn over time that Kurose’s life has never been particularly great, and that he actually was bullied in school. His lack of confidence in himself and his several anxieties do make sense, which is good, even if they can make him somewhat annoying. In part, Miman Renai is about Kurose healing himself and becoming a decent human being, and much as I rag on the bloke I have to admit I can relate to him more than I’d like to. And that’s about all there is to say about Miman Renai without spoiling developments. It’s a sweet series all in all, and I must say that I like it. 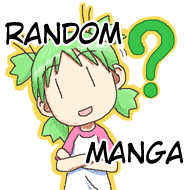 Though the subject matter is technically morally ambiguous, in execution this is a series for those pure-hearted folks I keep turning away on my lewd manga reviews. Kurose is a sweetheart, Tomoe is a sweetheart, and in the end I thought they were very nice main characters. 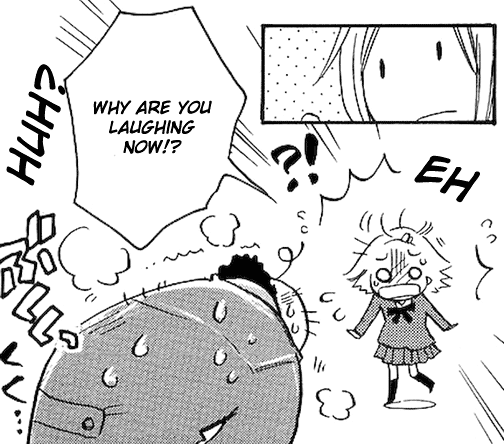 Overall, this is a very cute manga with comedy that hits pretty much always. The laughs are goofy and simple. Both the cute and the comedy succeed thanks to the art, which isn’t great, but is loose and adorable and cartoony. A good sense of humor keeps this whole fluffy affair together. You can import Miman Renai from Bookwalker (guide), honto (guide) or ebookjapan. 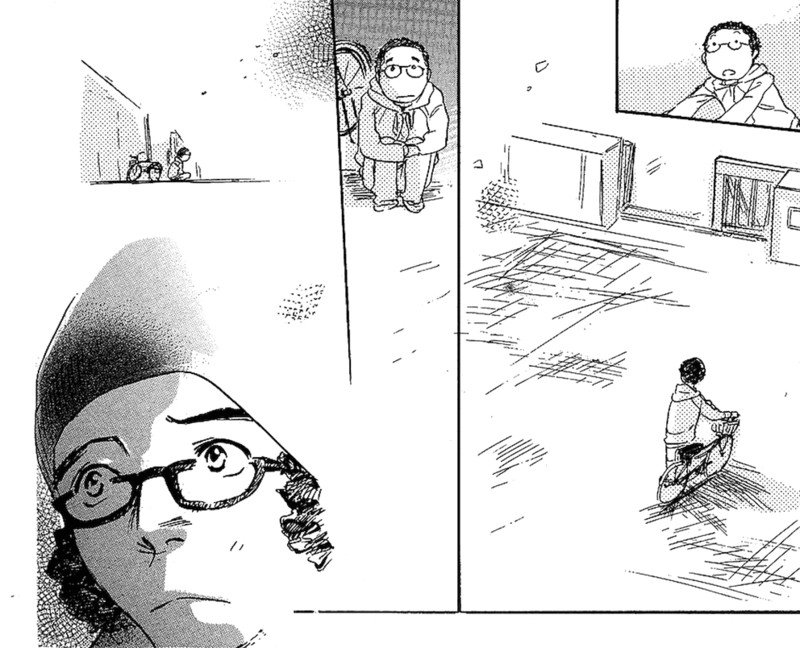 If you’d like your heart to be warmed and don’t mind a few bumps along the way, give this manga a shot. Alright, thanks for reading! 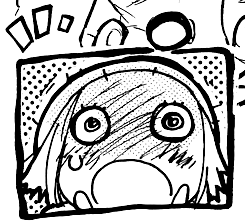 Next time it’s perverted manga again.